VATICAN CITY (CNS) — Being afraid and concerned about the impact of migration is not a sin, Pope Francis said, but it is a sin to let those fears lead to a refusal to help people in need. 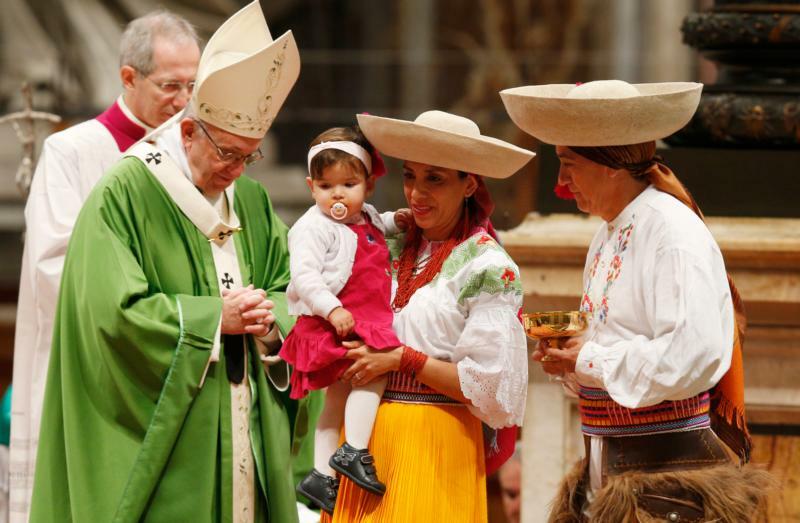 “The sin is to allow these fears to determine our responses, to limit our choices, to compromise respect and generosity, to feed hostility and rejection,” the pope said Jan. 14, celebrating Mass for the World Day of Migrants and Refugees. Thousands of migrants and refugees now living in Rome, but coming from more than 60 countries, joined Pope Francis and an international group of cardinals, bishops and priests for the Mass in St. Peter’s Basilica. Sixty of the migrants and refugees carried their homeland’s national flags into the basilica before the Mass and hundreds wore the national dress of their countries, including many of the people who read the prayers of the faithful and brought up the gifts at the offertory during the multilingual Mass. While care for migrants and refugees has been a priority for Pope Francis, the World Day for Migrants and Refugees has been an annual celebration of the Catholic Church for more than 100 years. St. Pius X began the observance in 1914. After reciting the Angelus in St. Peter’s Square after the Mass, Pope Francis announced that “for pastoral reasons” the date of the annual celebration was being moved to the second Sunday of September. The next World Day of Migrants and Refugees, he said, would be marked Sept. 8, 2019. According to the United Nations, an estimated 258 million people are living outside the country of their birth. The number includes 26 million refugees and asylum seekers, who were forced to flee their homelands because of war or persecution. In his homily at the Mass, Pope Francis reflected on Jesus’ response to the disciples who asked him where he lived. “Come and you will see,” Jesus tells them, inviting them into a relationship where they would welcome and get to know each other. For the migrants and refugees, he said, that includes learning about and respecting the laws and customs of their host countries. “It even includes understanding their fears and apprehensions for the future,” he added. For people in the host countries, he said, it means welcoming newcomers, opening oneself “without prejudices to their rich diversity,” understanding their hopes, fears and vulnerabilities and recognizing their potential. ‘In the true encounter with the neighbor, are we capable of recognizing Jesus Christ who is asking to be welcomed, protected, promoted and integrated?” Pope Francis asked.